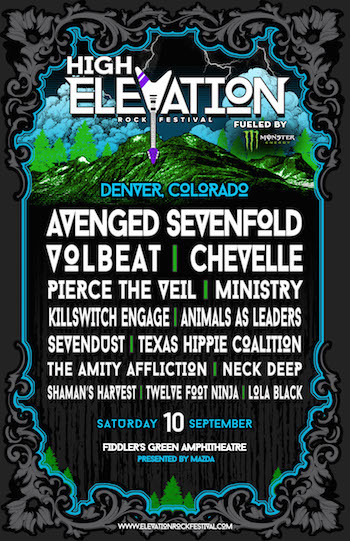 AEG Live's High Elevation Rock Festival—fueled by Monster Energy—will debut Saturday, September 10 at the world famous Fiddler's Green Amphitheatre in the Denver, CO area. 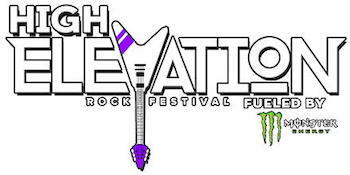 High Elevation Rock Festival will feature 11 hours of non-stop music on two stages amidst rolling grassy slopes and spectacular Rocky Mountain views, with performances from Avenged Sevenfold, Volbeat, Chevelle, Pierce The Veil, Ministry, Killswitch Engage, Animals As Leaders, Sevendust, Texas Hippie Coalition, The Amity Affliction, Neck Deep, Shaman's Harvest, Twelve Foot Ninja, and Lola Black. "Colorado has always been a stronghold for live music of all genres, including hard rock," commented Joe Litvag, Executive Producer of High Elevation Rock Festival for AEG Live. "We're excited to create something original and unique for all of the hard rock fans throughout the Rocky Mountain region, and there is no better place to call our home than the legendary Fiddler's Green. Expect 11 straight hours of insanity with some incredible and impactful performances by the greatest names in rock today!" Presale tickets for High Elevation Rock Festival will be available from Wednesday, May 18 at 10:00 AM MDT through Friday, May 20 at 9:59 AM MDT at www.HighElevationFestival.com. Visit the High Elevation Rock Festival social media pages for a password to purchase presale tickets. The public on-sale begins Friday, May 20 at 10:00 AM MDT. A limited number of General Admission Lawn 4-Packs will also be available for $198. For those who want to make a weekend out of it, a limited number of Hotel Packages for two or four people will also be available for purchase. Hotel packages will include accommodations close to the festival site, premier parking, and festival shirts for each person. A limited number of discounted ticket 4-Packs will also be available for active military through High Elevation Rock Festival partner GovX (www.govx.com). High Elevation Rock Festival is produced by AEG Live, producers of Rock On The Range, Monster Energy Carolina Rebellion, Rocklahoma, Northern Invasion and other U.S. rock festivals. AEG Live, the live-entertainment division of Los Angeles-based AEG, is dedicated to all aspects of live contemporary music performance. AEG Live is comprised of touring, festival, broadcast, merchandise and special event divisions, fifteen regional offices, and owns, operates or exclusively books thirty-five state-of-the-art venues. High Elevation Rock Festival is fueled by Monster Energy. Fiddler's Green Amphitheatre is located at 6350 Greenwood Plaza Boulevard in Greenwood Village, CO, just outside Denver. For more information on the venue, visit: www.fiddlersgreenamp.com.